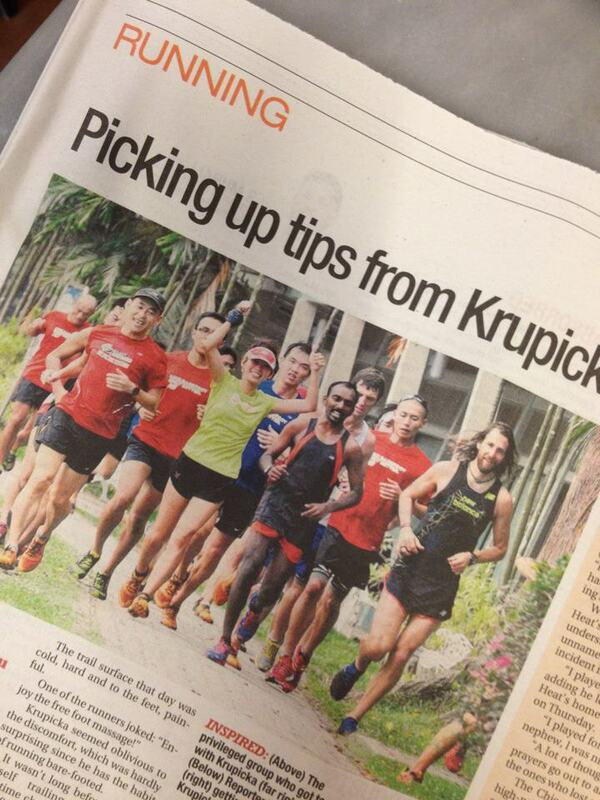 It was 2 weeks ago when Team FatBird Running received an exciting piece of news from our friends from New Balance Singapore – Anton Krupicka , the Ultra Marathon extraordinare with many accolades and titles to this name in the world of ultra marathon adventure and endurance races, was coming to town. 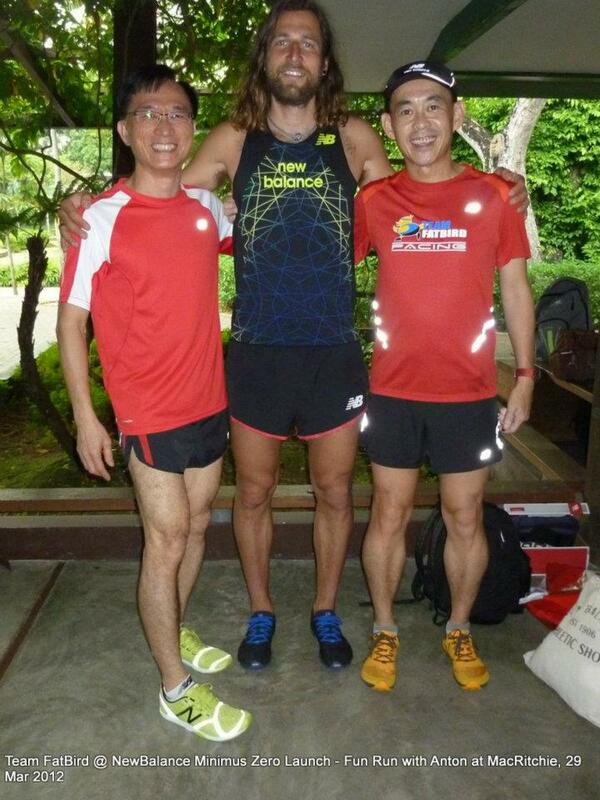 Even more exciting was that a selected few of us were to personally meet up and run alongside this man, who rides the wind with nary any noise nor fuss. 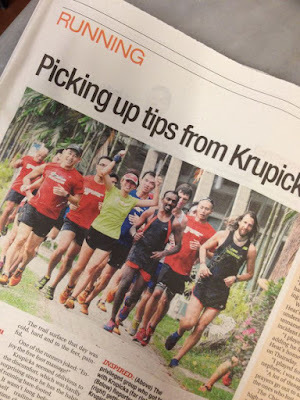 There was a buzz in the local community when Anton arrived, and as the hours unfolded with stories about his simple and carefree lifestyle, the local running community got excited about how this ultraman, for all his age of just 28, could live so simply and yet accomplish so much. 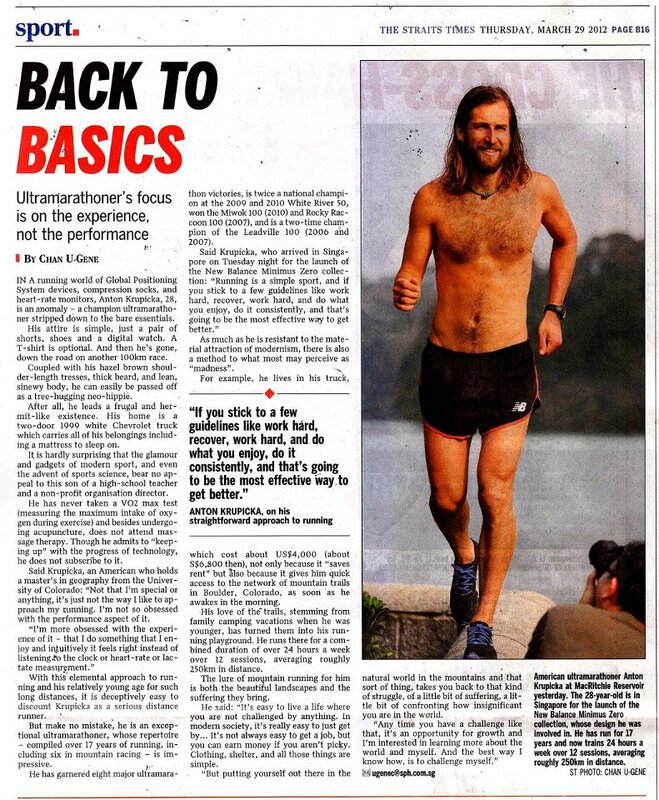 The Straits Times and New Paper articles spoke of his living in a truck, waking up in the morning and just running into the Colorado mountains to begin enjoying his trail mileage of 200miles a week…for most of the time, Anton just need a pair of shorts (he runs barebody mostly) and a reliable pair of shoes to protect him from the elements. Anton burst onto the minimalist running scene with his invaluable inputs to the New Balance Minimus shoes that eventually set THE LIGHTEST on for new Balance to enter the minimalist running scene in a huge way, getting all the competitive shoe companies out there paying lots more attention to this new area of running shoe development. The Minimus Trail (MT10) and before that, MT101, were trail shoes that received many rave reviews and recognition from not only the ultra-runners, but also the mainstream running community who were on a prowl for shoes and equipment which can help them achieve better running form as mentioned in the by-now-famous bible of barefoot running “Born To Run”. Lots more about Anton can be gathered HERE @ Wiki and at his blog – Riding The Wind! 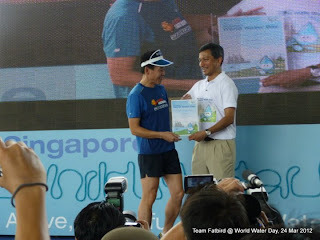 When I arrived to MacRitchie Reservoir (MR) amenities centre, Anton was already there chatting with fellow runners and the media. 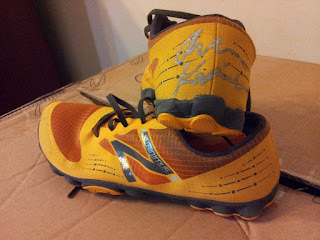 I quickly grabbed the opportunity to get an autograph on my newly-minted MT00 (kind courtesy of NB) as well as my TFB Running Tee. Anton, being the humble guy, not only entertained our requests for autographs, but also took the time for photos as well as talking about his feel of the Singapore weather and running community. As I continue to engage him at close range, I still cannot absorb the fact that he is only 28, with such a big manner and maturity about him. Edmund from NB gave a brief of the route and with some light stretches, we headed straight onto the Northern Route. As Anton was still recovering an injury, and he has a Ultra Marathon race in 2 weeks, we were told not to push him too hard…of course we had fast and experienced local runners like Sham, Ford, Jeri to be around just in case. As we ‘jogged’ into the trails, we realized that Anton’s recovery pace was faster than many of our race pace for 5-10km…hahaha. 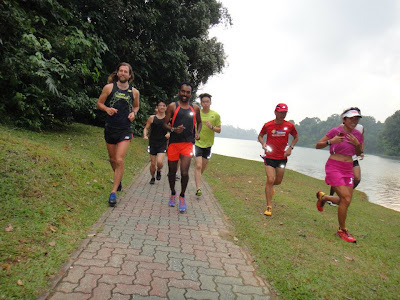 It was sheer fun to see the group of lead pacers running together with Anton, with a few of us deciding to play the role of ‘roving’ cameramen to take some nice pictures and photos of the team in action. Anton has an effortless-looking stride and very relaxed form, probably explaining why he could go on for 100-150miles at that kind of fast speed through rock mountain terrain. 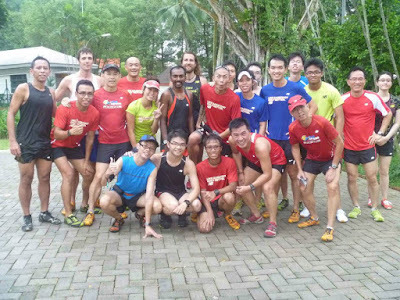 Because of the earlier rains, the MR trails were rather wet and slippery, but all these were mostly welcomed by Anton, who found the trails a little rocky, but more natural and becoming of a run through nature. As with riding the wind, the run was speedy, smooth and quick. It was in no time we were back to the start of the trails, covering 7km within 35min, inclusive of stoppages for photos of course…PANT, PANT, PANT! The NB MT00 shoes were taken through a good test on the muddy MR terrain that day, and I must say they passed with good grades, esp. in the area of lightness, trail-holding and versatility in uneven terrain. It was an enjoyable experience for me to have run with a Ultra Marathon legend, and I was glad that the distance was short enough for me to at least catch some shots of the man and have a few words in between while sucking in air. 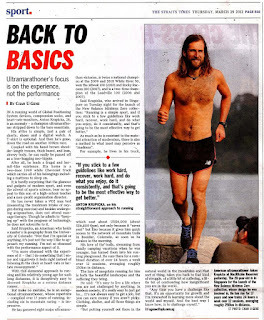 I didn’t spend too much time with my fellow running friends who were there, but I guess we all will understand that it was an opportunity not to be missed to speak and interact with this humble Ultra Marathon legend while we have him at such close proximity. We heard that Anton is very interested in the Mt. Kinabalu Climbathon – often dubbed the toughest mountain race in Asia/World…we certainly hope to see Anton again soon, if he does come for this race. 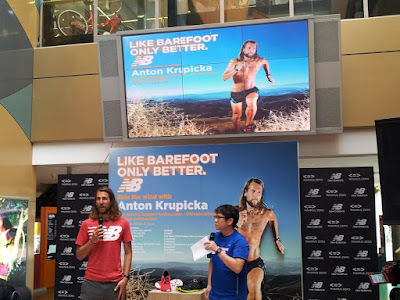 Till then, Team FatBird would like to thank New Balance for organizing this and more importantly, inviting us to meet with and Ride The Wind with Anton Krupicka! 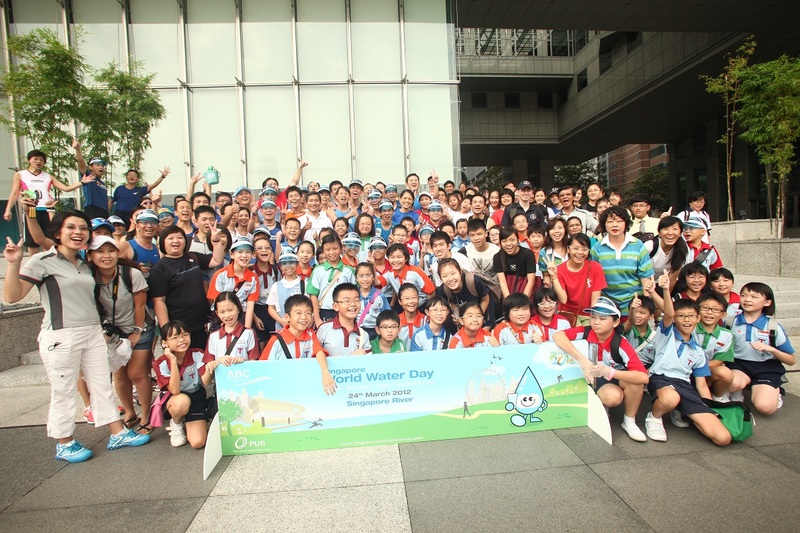 The World Water Day (WWD) is an initiative that grew out of the 1992 United Nations Conference on Environment and Development (UNCED) and held annually on 22 March as a means of focusing attention on the importance of water and advocating for the sustainable management of water resources. 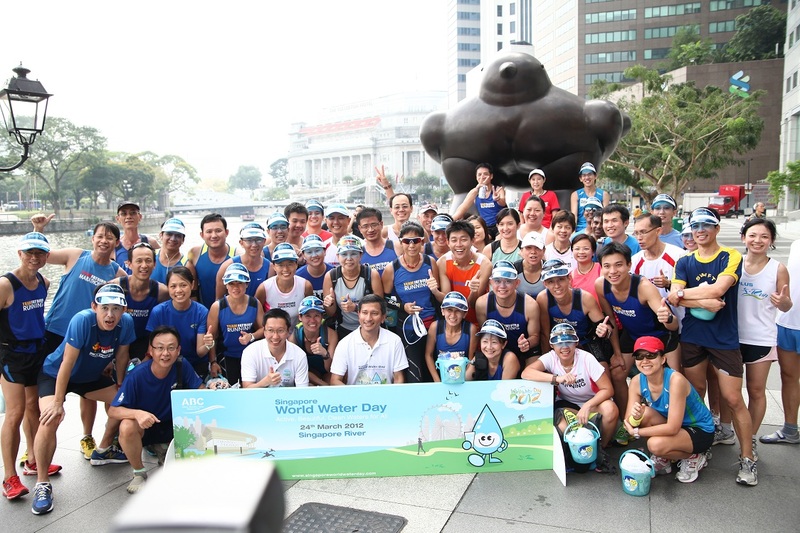 The Singapore World Water Day was held in conjunction, with activities by community partners across different Active, Beautiful, Clean Waters (ABC Waters) sites islandwide on March 24. These activities were aimed at bringing people closer to the waters, to inspire them to do their part to conserve and value water. 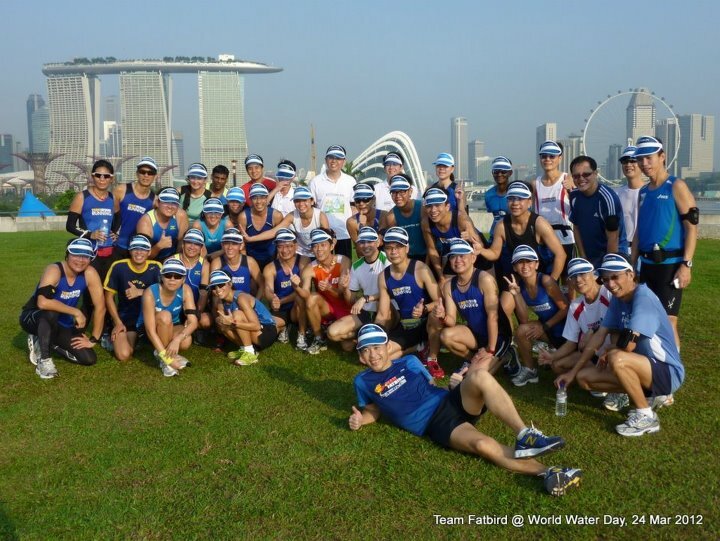 This year, Team FatBird had the honour of being invited to participate in this important event as a representative partner from the running community in Singapore. 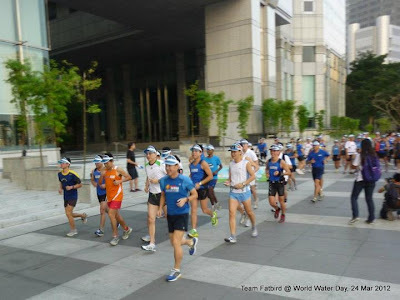 This is the first time the event was having a running group, along with many other partners and special interest groups like cycling, kayaking, Tai-Chi, Brisk-walkers and various sports groups, schools and communities participating. 80+ FatBirds showed up bright and early on a Saturday morning at the FatBird Statue just below UOB Plaza @ Raffles Place. 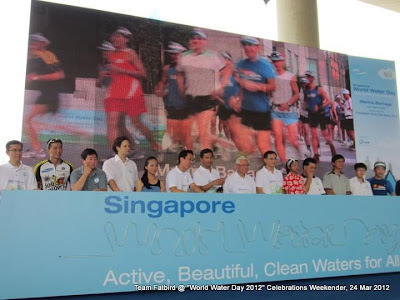 After we picked up our WWD visors, we were joined in by a special guest, Permanent Secretary, Environment & Water Resources, Mr. Desmond Kuek for the 6km run-in to Marina Barrage for the WWD Celebrations and Ceremony. Mr. Kwek, himself an avid and fast runner, was with the leading pack Group 1 at an average pace of 6min/km and on occasion dipping closer to 5:30min/km. Groups 2 and 3, each comprising about 30 runners were also moving in unison with designated stops for group photos. The first stop was at the Helix Bridge where we did some FatBird shouts and jumps, to the amusement of the new runners and guests who joined us for the very first time. After that warm-up session, we ran along Marina Bay Sands, and then into Marina South, skirting alongside the yet-to-be-completed Gardens By The Bay. 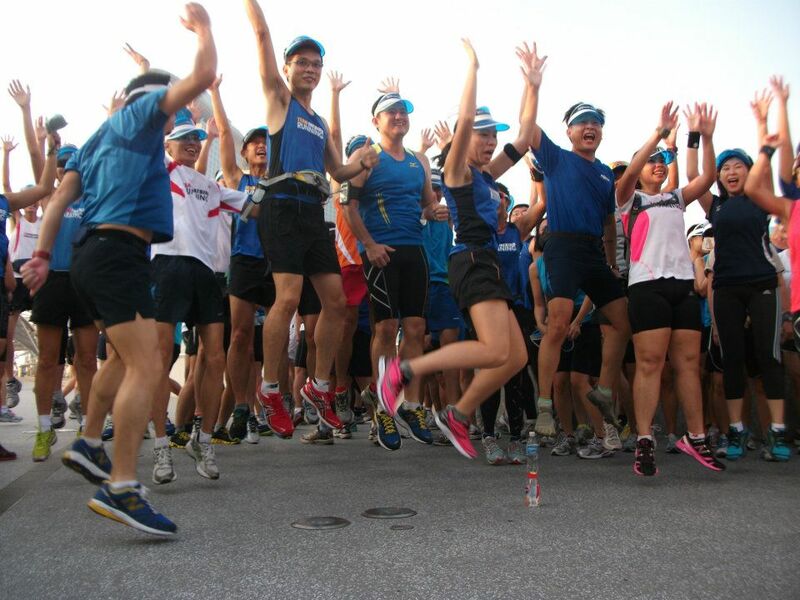 It was great fun running and chatting, as well as admiring the scenery and greenery along the way, with all the runners and guests having such a great time. 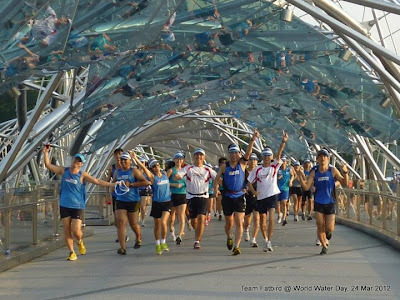 It was not long after that we finally reached Marina Barrage, met up and chatted with more VIPs who were there earlier for other WWD activities, before running up the slope to the roof garden of Marina Barrage. 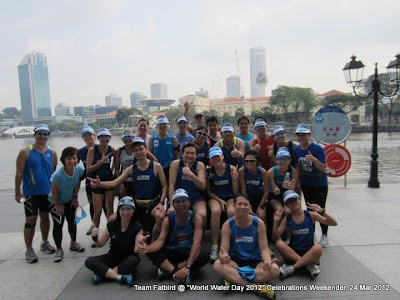 We had a nice group photo with Mr. Desmond Kuek and his team, before proceeding down for drinks and meeting up with the other FatBird groups coming in. Time passed quickly when we were having so much fun… soon we were called upon to standby for the WWD ceremony, led by Singapore’s President, Dr. Tony Tan and Minister Of Environment & Water Resources, Dr. Vivian Balakrishnan, Mr. Desmond Kuek and many other VIPs. Team FatBird had the honour to be invited on stage to be part of the ceremony of pouring water in a symbolic gesture of having Clean Waters flowing. 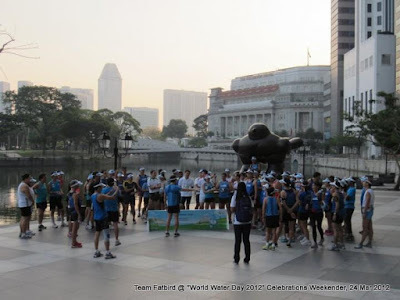 Following that, there was a video of the morning’s proceedings played out on the large screen, and when the snippet of TFB showed, there were loud cheers and encouragement for the team. 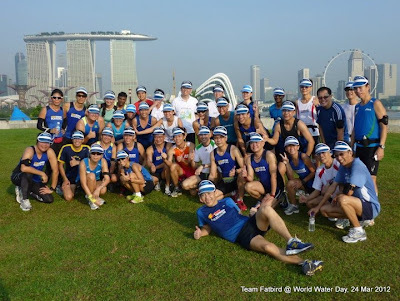 The respective partners were given Plaques Of Appreciation, with Team FatBird receving ours from the Minister to loud applause from our very supportive and enthusiastic Team FatBird Runners. Right after that, the team made our way back to UOB Plaza to meet with the Minister for the River Cleanup operation. Some of the tired FatBirds took the bus shuttle, while the rest ran 6km back to UOB Plaza. There we ended the run with the collection of Goodie Pails (a pail containing a towel and water bottle), and met up with other groups who were all waiting for the arrival of the Minister. Minister Vivian B. arrived shortly to loud cheers and applause, with lots of exchanges with the supportive crowd. Team FatBird had some great group photos with the Minister and VIPs, before rounding up the event with cheers to a very good run for a meaningful cause. 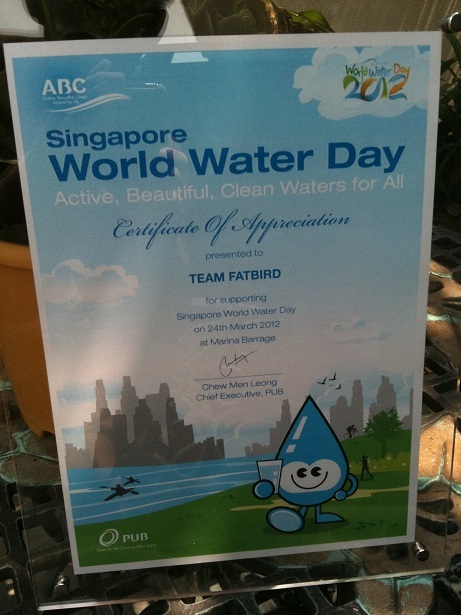 We would like to thank the PUB management for organizing such a great event, and having Team FatBird be an integral part of the World Water Day Celebrations. We look forward to be back for Singapore World Water Day 2013. Ops NightHawk Wk #3: R.I.C.E. As we progressed into the 3rd weekend of training, the NightHawks were beginning to feel some aches and soreness from the increasing distances. We started the morning with a nice chat about the importance of R(est).I(ce).C(ompresssion).E(levation) and how it could help all of us recover faster and better sustain the increasing efforts required of the training plan. The NightHawks were all eager to put some of their newly purchased shoes, compression gear, hydration belts to the test as we breach the 15km (HM) and the 25km (FM) distances. In the end, due to some accounting abnormalities, the trainees completed 16km and 28km respectively – although no one really complained 🙂 It put us in good stead for this coming week’s Night Run into the city, something which all are looking forward with a tinge of excitement. 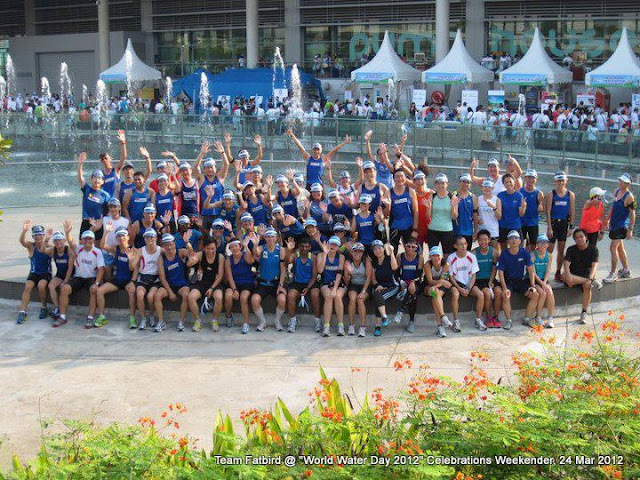 The various Pace Groups had pre-run briefings before being flagged off in waves. The weather started to look up as we progressed towards Fort Road, exchanging greetings with other training groups and familiar faces as we crossed paths. There was pretty good distribution of forces amongst the various groups this morning, with Group 1 having a nice turnout as well. The groups were honing in their training paces (race base+15-30sec) as required, and all were staying tightly-knit for the first half the journey. 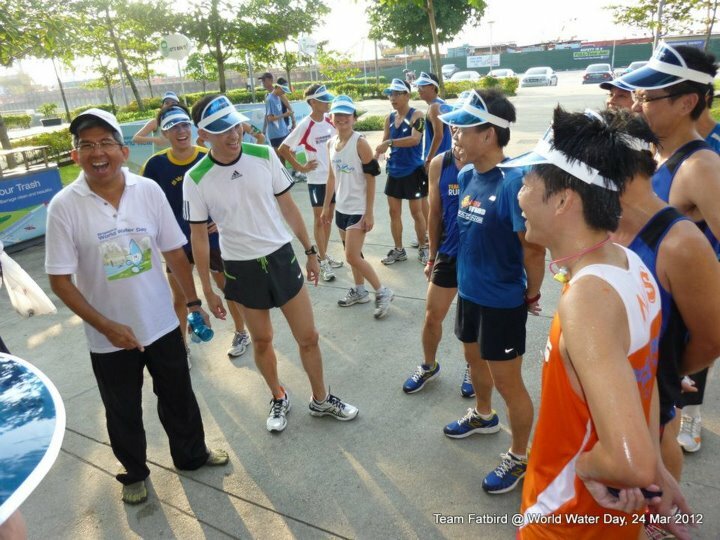 The weather remained relatively cool, and that helped us enjoy the run with chit-chats and laughter to jokes being cracked. 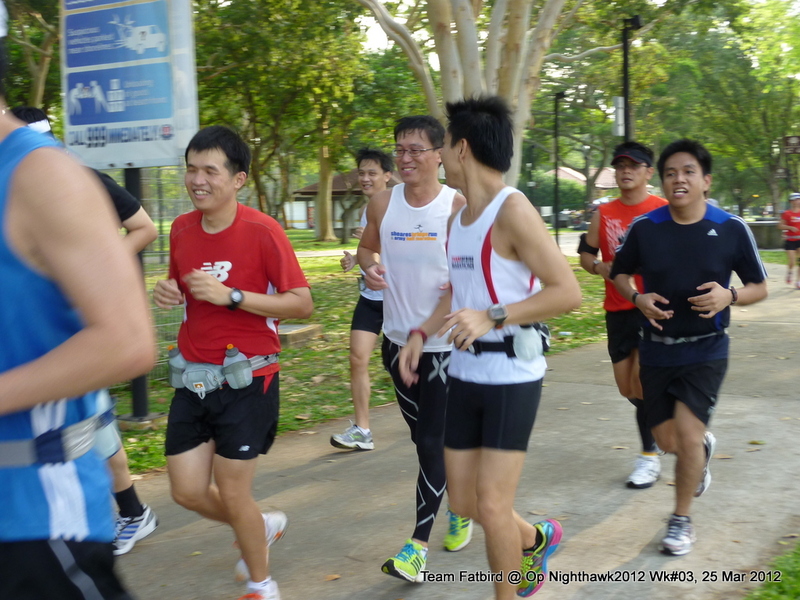 The HM NightHawks were steady throughout their full 16km, probably seeing only a slight decay in pace after the 12km mark. 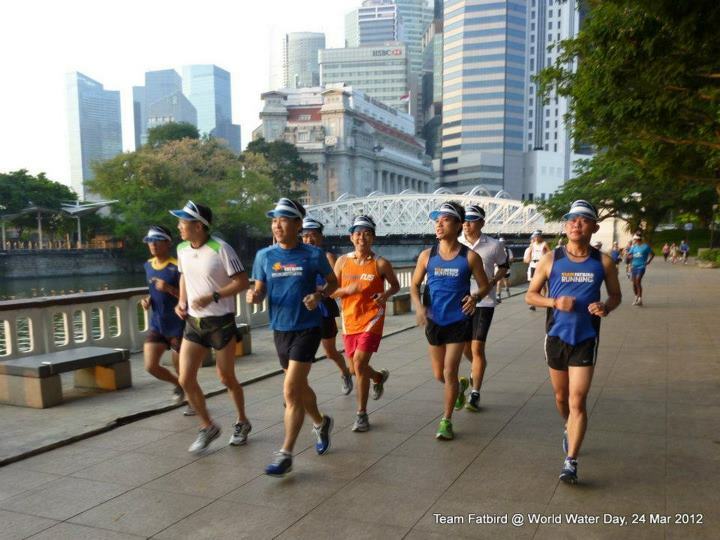 The FM folks started to see some kind of strain on the cardio and legs only as they crossed the 20km mark. Those with newly acquired compression tights were suitably impressed with what a week made to their ability to fend off tiredness in the legs. Based on the post-run briefings and feedback, most of the NightHawks had good runs this morning, and most groups were able to keep within the band of target training zones. With one quarter of training accomplished, we have built up a good sustained base of 15km-25km within BaseBuild zone. 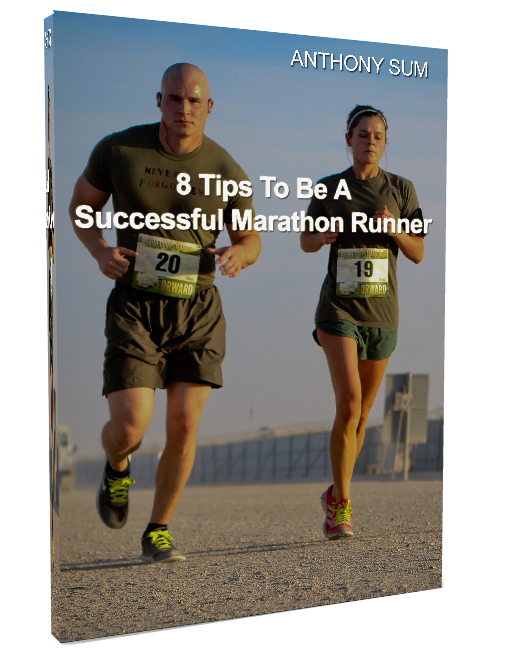 This will set us in good condition as we move into the second quarter of training with increased distances, but with target paces maintained. This coming weekend’s run will have us visiting the City, start/end and route of the Sundown Marathon, in what promises to be an interesting night of conditioning and familiarization, as well as running in a bigger bunch as the Lead-Up Runners join us. Till then, let us have a well-deserved R.I.C.E. and set ourselves up for the continuing NightHawk journey ahead. It was a warm day, turning cooler into the evening – just the right atmosphere for the first night training for the NightHawks. The second weekend session of Operation NightHawk saw a good turnout at MR Amenities Centre, all looking forward to challenge themselves to the Reservoirs route they have heard so much about. After briefings of the run requirements, route and safety tips for night running, the trainees were dispatched in groups along with their respective trainers and pacers. 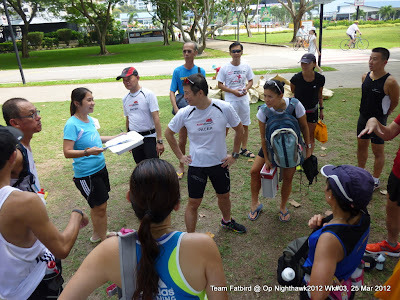 The NightHawk Training Crew were doing a great job of guiding the runners, especially at critical junctions and important turning points. The light sticks and flash lights don by the participants made it a sight to behold as the various groups ran in tight-knit bunches along the enchanting stretches of UPR and OUTR. Although the groups started out still a tad fast for this BaseBuild phase, it was much improved over the first training last week. As the conversations and sight-seeing (in the night?) began, the NightHawks were able to settle into more comfortable paces, contributing to many a strong finish on the return. 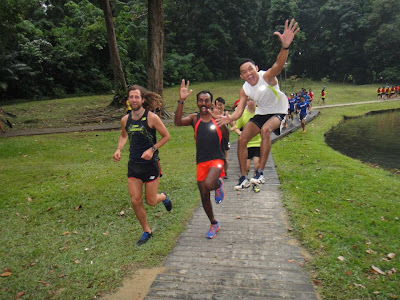 It was an interesting experience for many of the runners new to the route, made more exciting with the night running in groups flanked on both sides by dark, forested areas. As the NightHawks warmed up, they started to listen to their bodies and a number experienced the benefits of having a stronger, sustainable run by starting up more conservatively…all made possible with the motivation and good-feelings of running in their respective pace groupings. 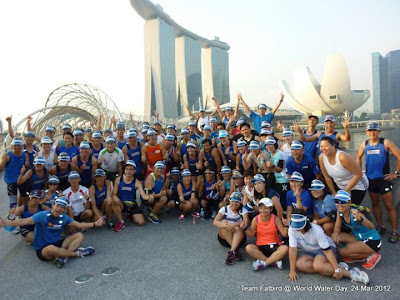 Starry, Starry Night – that was the song ‘playing out in our heads’ when we ran along the windy stretch of Seletar Reservoir Park, flanked on the left by the majestic body of water with the silvery reflection of the moon, and to the right the pitch-dark beauty of the forest. From above, we could see flashing lights bobbing in as a group, and knowing them to be Group 3, shouted and waved at them in delight. Once back onto the OUTR stretch, it was a quiet 3km stretch of delightful silence, where the sounds of uniformed strides provided the rhythm for a sustained pace home. Moans of relief and satisfaction were heard from some when we reached the small, dark road flanking the Little Sisters Of The Poor, indication that the end was very near. With iced-cold Gatorade and bananas as the ‘carrot’ of the already drained and hungry bunch, we were striding powerfully and running ‘tall’, pushing forward like marathoners approaching the finish line. 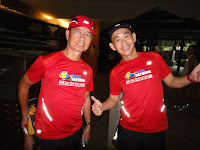 The completion was sweet, and with timings reported, it was a time for debriefs and sharing of our night run experience. With more night training runs to come, things can only get better as we progress towards Week #3 of Ops NightHawk. 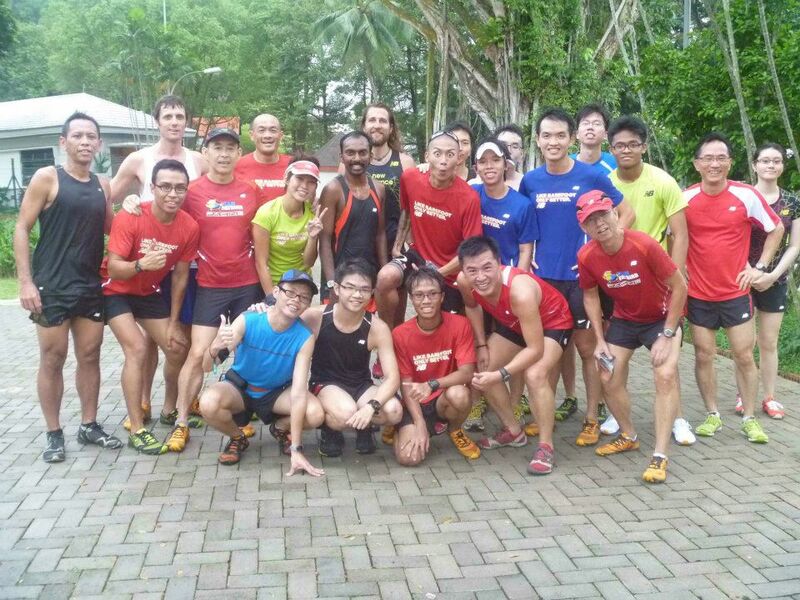 The NightHawks Have Survived The Enchanting Reservoirs Run. YeeYa!